Tomorrow is October 21st, 2015. 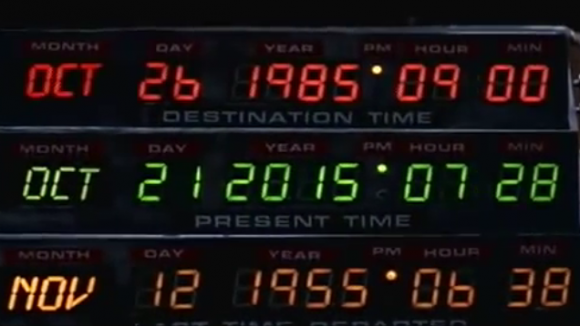 It has already, and quite rightly, been dubbed Back to the Future Day by film fans around the globe. 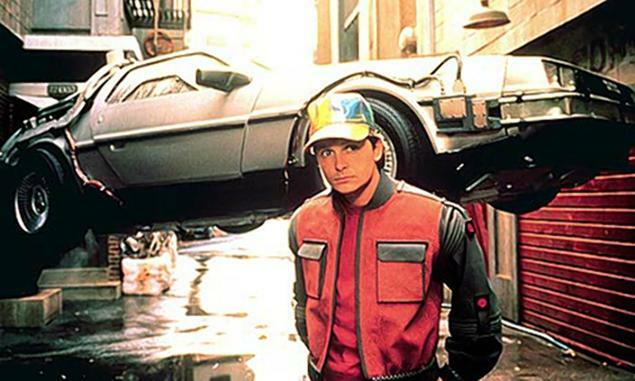 Yes, it is the day when Marty and Doc fly into Hill Valley to find themselves in a world of flying cars, hover boards, power laces, cosmetic implants, portable nuclear power, and drone devices. At face value, it would seem that the film’s writers were off the mark. But when one takes a closer look, perhaps they were on the money. In the film, it seems colorful tights and peacock hairstyles are the in thing. Today, people seem to have no problem venturing out the house with leg ins on, and the onset of tight jeans on men, as well as loud shirts, coupled with an increased tendency towards conspicuous tattoos and eclectic facial piercings, lead me to think that the filmmakers were onto something. 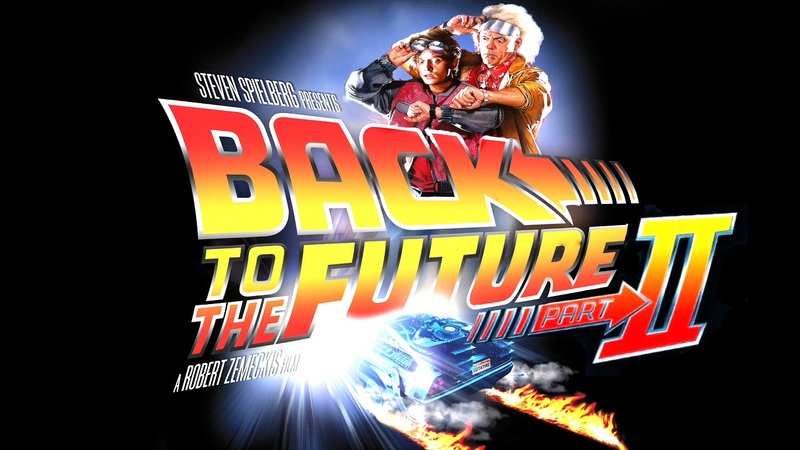 In Back to the Future’s 2015, homes are equipped with huge flat screen televisions or with projectors, where one can watch multiple channels at one time. Sound familiar? Marty McFly is unceremoniously fired via video call after he scans his credit card from home to partake in a dodgy financial scheme. Video calls are a regular thing now via Skype and FaceTime, and the neat convenience of completing financial transactions from the comfort of one’s home is now something we take for granted. Watch the film again closely. 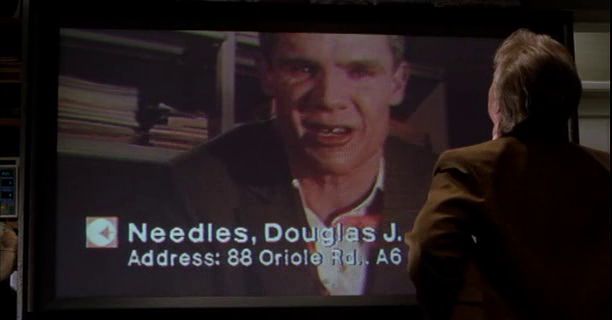 While Marty is on the video call, he could read all the personal details of the other person, Needles, as they flashed across the screen. Everything from personal food likes to political affiliations is available viewing for all to see. In our 2015, we are perhaps too transparent online, laying out almost every aspect of our lives for the wider world to see. Bio recognition devices add security to the McFly home, as we see when Jennifer must press her thumb to the plate at her front door. While not in every home yet, many businesses, like Google, are using bio recognition technology at the workplace. Most smart phones are now also equipped with fingerprint recognition. Thank you, Apple. In the film, drones complete mundane tasks in the street and have seemingly replaced photographers and cleaners. We might not have drones everywhere (although they do exist) but we now have smart technology that makes our lives easier at every turn. iPhones and similar devices have allowed for instant access to information and entertainment. It’s also true that news photography is under pressure from the onset of citizens going freelance and taking shots before sending them to news outlets for a quick buck- such is the ease of taking a photo these days. One can also infer that kids’ entertainment is highly technical in the film, after a young brat derides Marty for showing off his skills on an ‘old’ 1980’s arcade game: ‘you mean you have to use your hands! That’s like a baby’s toy.’ Well, now we have the Wii, Bluetooth, and good old Siri, making the requirement to use ‘your hands’ less necessary. 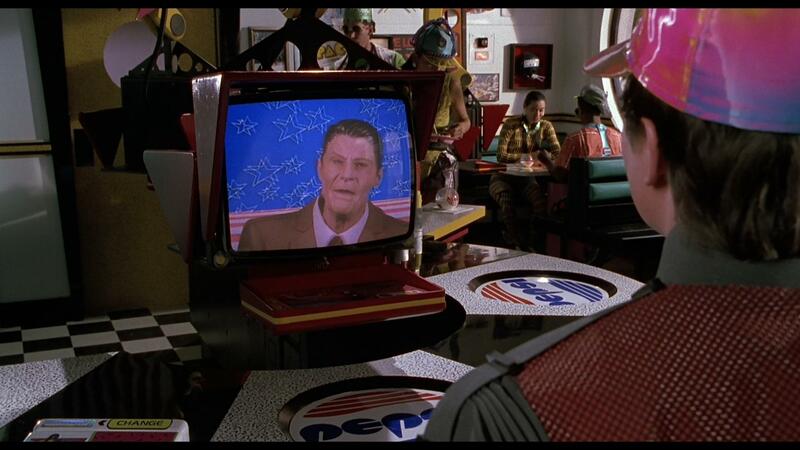 When Marty walks in to the Cafe 80’s in 2015, he is not met by a person behind the counter, but by a computer. Nowadays, we have self check in at airports, and self checkout at major retail outlets. One are the franchise explores throughout the series is that technology can be a blessing as much as a curse. The Doc’s great invention had the potential to achieve great things, yet it was not to be. In our society, we are increasingly challenged by the shifting power of technology, given that one of the biggest challenges our economy faces today is job transition for those who find their occupation rendered obsolete. 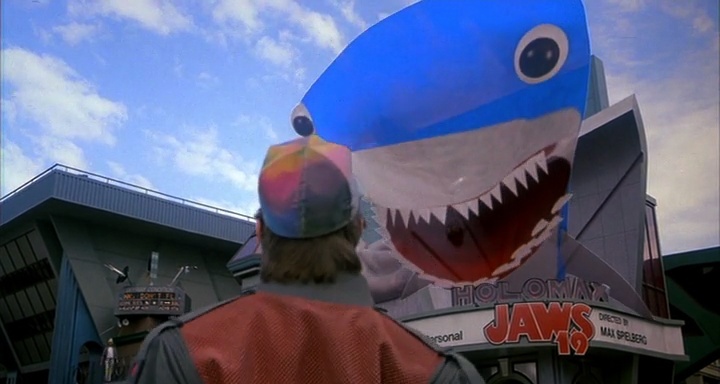 As Marty scopes out Hill Valley in 2015, we see adverts for ‘Jaws 19’, hinting at a society fond of sequels. Sound familiar? Today, almost every successful film becomes a franchise, with studios flogging the horse until every last dollar can be taken from it. How many Pirates of the Carribean movies are we up to now? 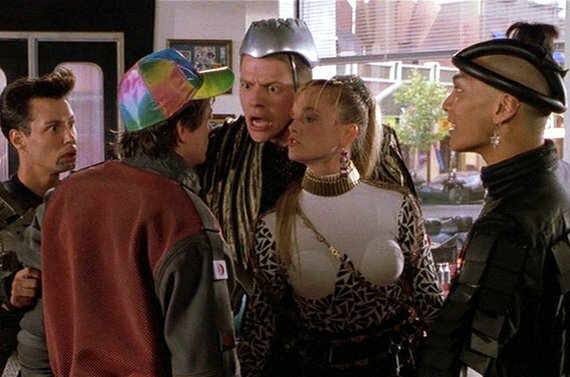 People will be people, and so it was in Back to the Future’s 2015. Young hooligans like Griff are causing trouble, and young Marty jnr commits stupid acts under pressure to conform and fit in. Sadly, this reflects our current society too. A collection of overentitled youth and disenfranchised misfits still cause problems on a daily basis. I don’t think this will ever change. Also, the film hints at unhappy marriages, as clearly Marty Snr’s once strong relationship with Jennifer is on the rocks. Today, divorce rates are at unprecedented levels. A sure way to correctly predict the future is to focus on human conflict, as it will surely be there. While we haven’t exactly abolished all lawyers, like the film predicted, we do now have mandatory sentences and instant penalties designed to fast track the legal process and make it more efficient. Okay, sure, we don’t have flying cars in every street, but it’s also true that flying has become so regular and affordable for most that many people fly at least twice a year. It’s a stretch, but what was once a rare means of transportation has become common for many. In Back to the Future’s 2015, people are so vain that they spend money on cosmetic implants at ‘Rejuvenation Clinics’. We might not have cosmetic organ implants, but cosmetic surgery and use of Botox is becoming more common. There’s that, and also the idea that humans are so superficial and narcissistic that they’d pursue such a thing, and we are most certainly living in the age of narcissists in 2015. 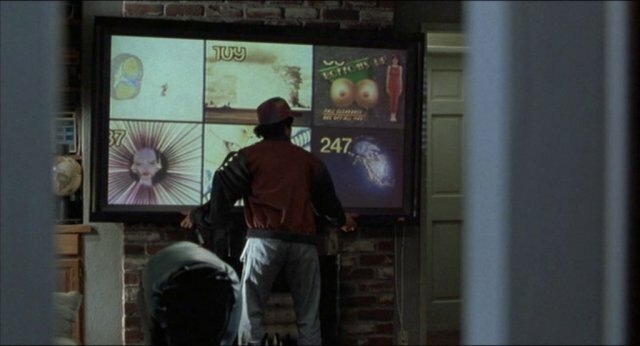 Overall, the writers of Back to the Future 2 were remarkably prescient when crafting their crystal ball and painting 2015. While differences will always be apparent when one predicts the future, it’s interesting to see how much of the human experience they got right.